H&R RSS Club Sport Coil overs are for the true enthusiast looking for the ultimate in adjustability and overall performance. Similar to the H&R Street Performance Coil overs, RSS Club Sport Coil overs feature a fully-threaded shock body (not an imitation sleeve-over) that allows you to precisely dial in height adjustment to achieve optimum weight transfer, or simply get the aggressive look you've been looking for. Featuring H&R's exclusive dynamic damper technology, allowing you the user to choose how soft or stiff of ride you would like. H&R Coil overs allow the user to choose exactly how low you want your car to sit, and can be changed at any time. RSS Club Sport Coil overs are the firmest and best handling coil over in the H&R street line. 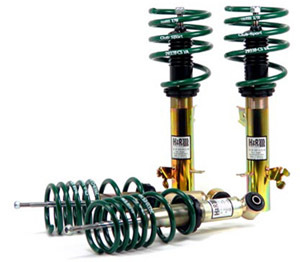 RSS Club Sport Coil overs are ideal for anyone looking for the ultimate suspension upgrade. H&R prides itself on its numerous 'firsts' and innovations that have revolutionized the suspension industry. One of H&R's ingenious creations is its exclusive, patented rear height adjusters. Used for height adjustment in vehicles that have a separate rear spring / shock setup, the H&R exclusive Rear Height Adjusters in effect replace the lower rear spring perch with an easily height adjustable spring seat design. Using a hex key, a simple twist of the wrist is all that is needed to raise or lower the rear of the car. H&R's exclusive Rear Height Adjusters accompany some applications. Why RSS Club Sport Coil overs? RSS Club Sport Coil overs provide an increased spring rate, and more shock valving which translates into better handling and improved suspension feel. Club Sport Coil overs are designed for the true enthusiast looking for an aggressive ride, and handling characteristics. They are perfect for anyone that drives there car on the street, and frequents the track. A coil over suspension basically gives you a matched lowering spring and shock absorber combination with the added benefit of adjustable ride height and spring rates through a moveable spring perch or perches. Coil overs reduce unsprung mass, increasing suspension travel, and allowing the car to be corner balanced.